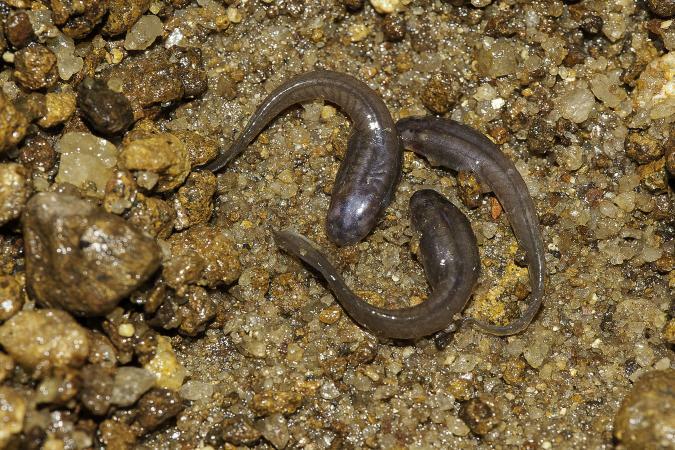 A dancing tadpole that burrows through sand has been discovered in the Western Ghats of India, a scientists report says. Report says that tadpoles would not normally burrow through sand, nor swallow the material, but this 'remarkable tadpole' does. It belongs to the Indian Dancing frog family, Micrixalidae. The new findings underlined the 'uniqueness of amphibians' of the Western Ghats. A group of scientists from University of Delhi, University of Peradeniya and Gettysburg College discovered and documented the larvae, and genetically confirmed their identity as Micrixalus herrei. These tadpoles remained unnoticed for years because of their fossorial nature, which in itself is a rare occurrence in the amphibian world, said Prof SD Biju from University of Delhi. The scientists said that tadpoles were discovered from 'deep recesses of streambeds' they live in total darkness until they fully develop into froglets. These frogs are known for waving their legs in sexual and territorial display, but tadpoles from this family had remained a mystery for scientists. The Western Ghats is a mountainous region in southern India which is known as a hotspot of biodiversity.